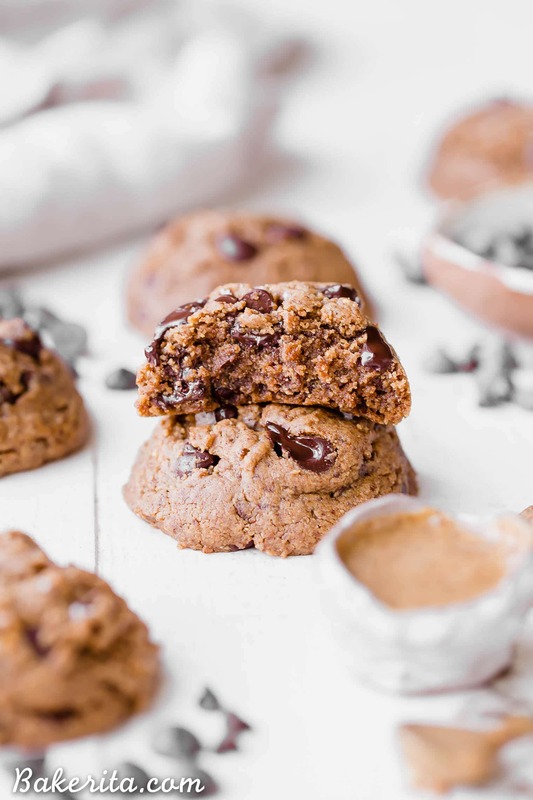 These naturally Flourless Almond Butter Chocolate Chip Cookies are so tender that they melt in your mouth! These flavorful cookies have just 5 ingredients and they are gluten-free, Paleo, refined sugar-free and vegan. This post is sponsored by Di Oro Living. These Flourless Almond Butter Chocolate Chip Cookies have been a staple around here for a while, and although they’re on the healthy side, no one would ever turn one down for being “too healthy.” In fact, these cookies are so rich and decadent, I bet no one will guess they’re made so simply, with such wholesome ingredients. They also SO easy to make (just five ingredients!!!) and are so tender that they just melt in your mouth. They’re moist and soft and just a little crumbly. I used to make these back in college and my housemates would always DEVOUR them, and these days my family and friends do the same. We’re all always sad when these are all gone. 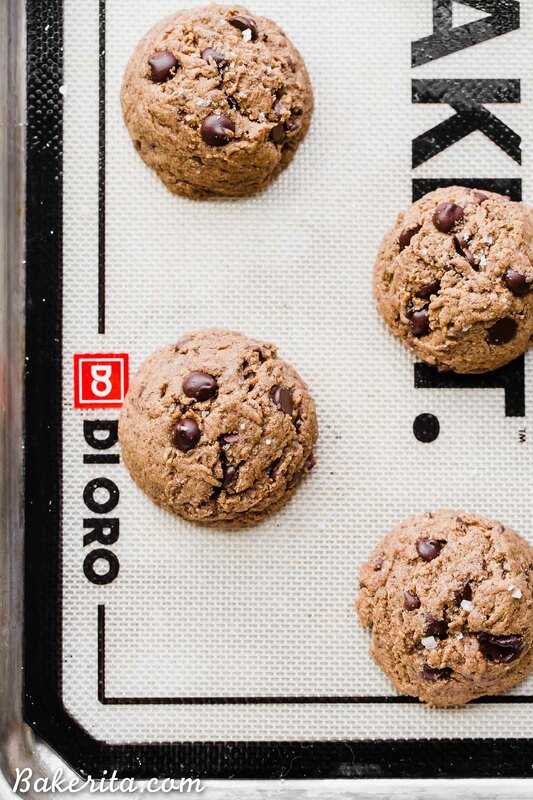 Now, before we talk about those 5 ingredients, I’ve got to mention my newest favorite cookie baking tool – Di Oro’s Nonstick Baking Mat! I’ve been using this for all sorts of cookies lately, and they all bake to even perfection and slide off without any issue. 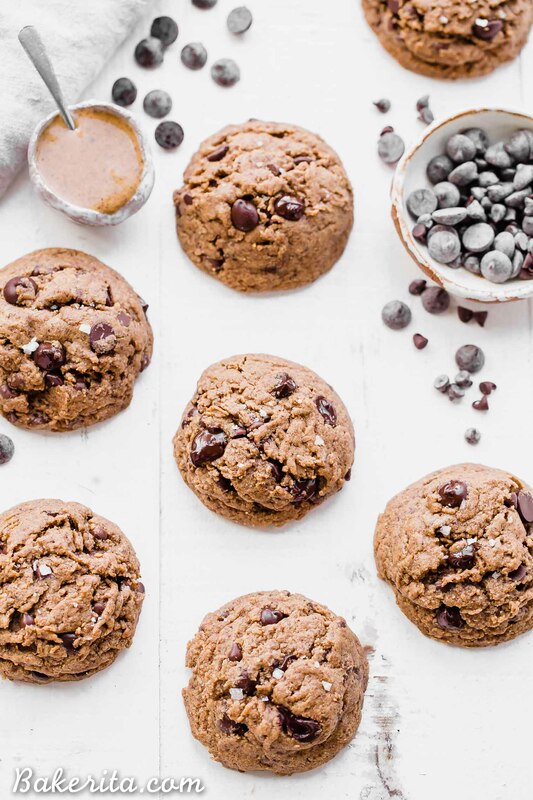 Flourless Almond Butter Chocolate Chip Cookies…oh YES, please! Alright – now onto the COOKIES!!! Let’s talk about those five simple ingredients, how they come together, what they can and can’t be replaced with, and all that good stuff! First up: almond butter! This is important since it’s the base of the cookie and provides the structure the cookies need to be flourless. I used plain creamy almond butter but realistically, you could use any kind or flavor of nut butter you choose. Just make sure the nut butter isn’t too thin and that all of the oils are fully incorporated into the nut butter or you’ll have oily cookies. If you’re allergic to nuts, use sunflower seed butter (perfect if your allergic to nuts) to keep these nut-free. To sweeten, I used coconut sugar. It’s my favorite for cookies because it allows the cookies to get nice crispy edges and a chewy texture. It’s a low glycemic sweetener, so it doesn’t cause such big spikes in blood sugar like traditional sweeteners. But, more importantly, it performs so well in baked goods as a replacement for granulated sugar and lends such a delicious caramel flavor. For the cookies you’re looking at, I used a flax egg, but in the past, I’ve made these with a real egg too. Both work very similarly, so use a flax egg if you’re vegan, and a real egg if not. A little bit of baking soda helps these get nice, thick, and puffy. Last but certainly not least, we’ve got chocolate. I ended up using a combo of regular sized chocolate chips and mini ones. Of course, you can also chop up a chocolate bar if you want some big chunks in there instead. Once you have your ingredients, it’s as simple as stir and bake. I recommend waiting 15 minutes between the stirring and the baking to let the ingredients settle together. This isn’t mandatory, but I noticed that the cookies that came from the dough that sat for a little while baked up a bit thicker and smoother. The oils and sugars had a bit of a chance to mingle and react to each other and it made things even more delicious. So if you have the patience, wait it out (seriously, it’s only 15 minutes). Make these, love them, and share them with the people that you love. They’ll love you for it. Enjoy! In a medium bowl, whisk together the almond butter, coconut sugar, egg (or flax egg), and baking soda. Fold in the chocolate chips. Let the dough rest for about 15 minutes. Bake for 8 to 10 minutes or until set. Let them cool for at least 15 minutes on the baking sheet, then transfer them carefully to a cooling rack. They will be crumbly if you try to move them too early, so be sure to let them set up. To keep completely paleo, make sure to use a paleo-friendly chocolate (you can make your own with this recipe) or leave out the chocolate chips to keep 100% paleo. If you use regular size chocolate chips instead of mini chocolate chips, use 3/4 cup. This post is sponsored by Di Oro Living. As always, all opinions are my own. Thank you for supporting the brands that support Bakerita! This post contains affiliate links. You always make such fantastic cookies. Seriously I can’t believe these are so chewy and flourless. I baked a similar cookie a couple weeks ago from Clean Eating magazine except that cookie called for sucanat. I’ll need to try them with coconut sugar next time. I also use the Whole Foods fresh ground almond butter (chunky). It was incredibly tasty and hard to believe it was devoid of flour. The texture is very similar to that of a cookies. Ohhh this is making me crave chocolate! I just got a new kind of almond butter that has espresso beans and vanilla in it. It is delicious! I bet it would be amazing in these cookies! These looks fantastic, Rachel. I’ve been experimenting with almond butter cookies but have yet to make one I actually like. Yours look delicious and perfect. I will be making these soon! I’m so intrigued by these being flourless – they look absolutely amazing! Ok Rachel, you are the paleo baking queen! These cookies sound amazing. And so easy! I just bought a bag of coconut sugar from Trader Joe’s and have been trying to think of what to use it in first. Looks like these cookies are it! These cookies look incredible, Rachel! I love that their flourless! 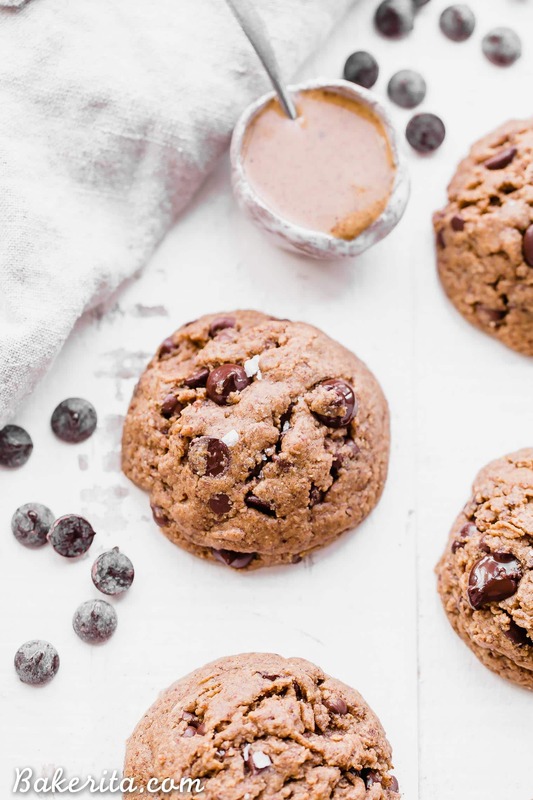 The almond butter and chocolate chip combo sound perfect! Isn’t coconut sugar the best?! Can’t wait to see your almond butter cookie :) Thanks, Marcie! I just recently started baking with nut butters and love it. These cookies look delicious! Pinned! I can’t believe these are flourless, they look so scrumptious. Well done! These cookies look gorgeous, Rachel! I’m always in awe of ones that don’t have flour. And I love the addition of almond butter! These cuties look so thick and fluffy, love it! Ooh, Rachel, this kinds of recipe is right up my alley! And I can totally relate to people associating certain “labels” with low-quality taste, even when it’s the farthest thing from truth! I bet these taste amazing. I’ve definitely pinned them (to more than one board). I love your photography here! Thanks so much, Mandie! You’re too sweet. I totally agree with you about the whole labeling my food thing. I just like food, I don’t discriminate haha. But I do feel like people dismiss food with “too many labels”. But heck, I don’t care what these are called they look BOMB. Pinned! Espresso and vanilla almond butter, YUM! I love all the different flavored nut butters there are out there! 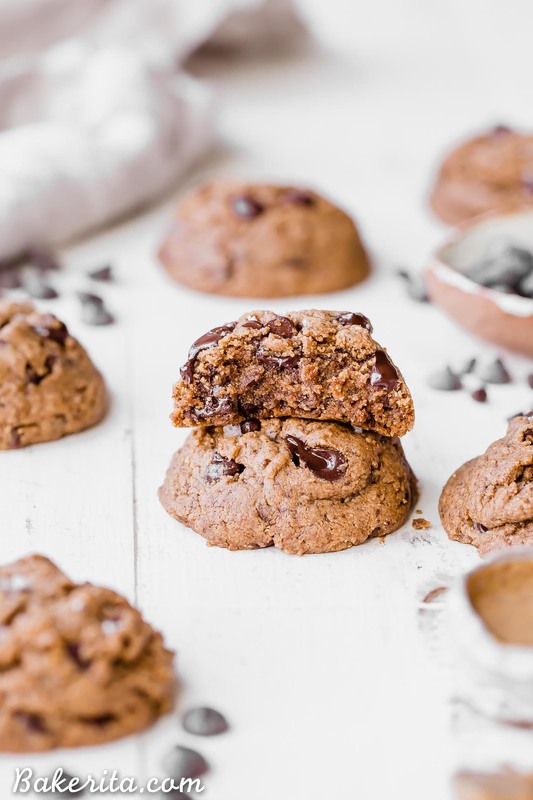 I’m 100% making these the next time I make cookies, my husband is a cookie nut, so I need to find ways to sneak a little bit of nutrition into that cookie diet of his!! 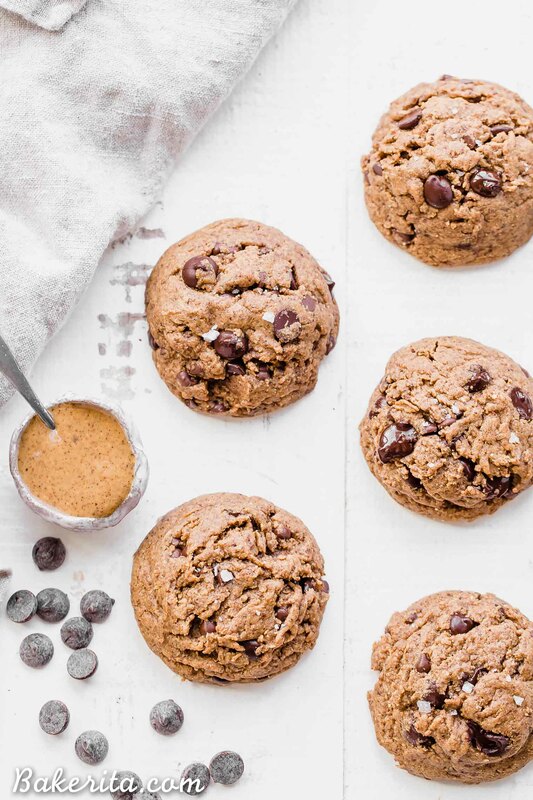 These look lovely I’m totally drooling :) Almond butter is the best, and the fact that these are flourless means they’re as chewy and rich as they look! im starting to get into this whole paleo thing just by seeing how many amazing recipes there are. almond flour must be a great flour to use because its used frequently…havent tried it myself. these are phenomenal looking cookies btw! There is no way that these are flourless… they look beyond amazing and perfect! Who needs gluten when there are beauties like these around! I agree! I hate saying things are gluten-free, because personally I love gluten! LOL! But I love when delicious things just happen to be healthy! These cookies look really awesome! I wholeheartedly agree – to dismiss these cookies would be just WRONG! Look at them! I want a dozen. Please??? These cookies look SERIOUSLY chewy and gooey! I want a dozen! Hey Rachel! Your delicious cookies look so fabulous, chewy and with the perfect crumb! I’m loving all the ingredients, too. I have baked with coconut sugar before… I ran out though and haven’t picked up anymore. Time to put it on the list. I think I’d get attached to these… especially for a quick breakfast! Oh My! Rachel, can you please post some pictures of your new place? I would love to see what such a creative mind can do for an apartment, which sounds absolutely lovely by the way. I could use some sunshine and brightness back here in dull Wisconsin! Love the sweets as always. I am sorry but these are the most dry cookies i have ever made or eaten. I followed the recipe and mine don’t look like yours at all. Quite disappointed as the recipe looked really good. Hi Jamie, I’m sorry you had trouble. Without being in the kitchen with you, it’s hard to know exactly what went wrong. Was your almond butter dry? It should be pretty runny and liquidy – not at all dry and chalky. Could that have been an issue? Over-baking at all could have also made them dry. If you can give me some more details, I can help you figure out what went wrong. I just made these exactly as the recipe says and I am in shock how chewy and delicious they are wow wow wow!!! True talent!!! But need to find paleo chocolate chips. I’m so thrilled you’re enjoying them Erica! I made these cookies today. I’m very impressed. Few ingredients lots of flavor. I like to be in control of what’s in my food. When I see the ingredient deck on most cookie packages, even supposedly healthy cookies, I cringe. Thank you for this recipe! Does chia work similarly as flax meal for egg replacer? Ty! It can, yes, I haven’t tried it with this recipe though so experiment at your own risk! This is such an amazing recipe and quite forgiving of the liberties I took with it. It still turned out great. Love this recipe! 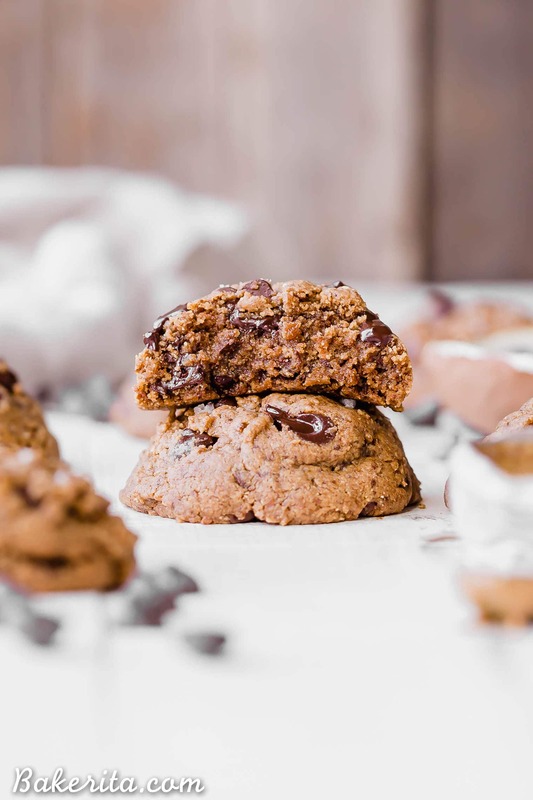 I’m pregnant and was looking for a dessert that was both yummy and provided some nutritional benefit, and the protein in these cookies is fantastic. They are so simple to make, and keep me filled up and satisfied afterward without a sugar crash of traditional cookies. I used dark chocolate chunks, and they’re legitimately some of the best cookies I’ve ever had. That makes me SO happy to hear, Kaly! So glad you’re enjoying the cookies and that they’re helping keep you satiated during your pregnancy. Enjoy! Oooh, so glad I found these. Recently made your other chocolate chip cookies and although I enjoyed them, I could taste coconut from the coconut oil which is not my preference. I love coconut but not in my chocolate chip cookies. The hubby and I still devoured them because they are yummy. PB and chocolate are my kriptonite so I can’t wait to try these. So glad I recently found your Instagram acct. Thanx for all that you do! I hope you love these cookies, Lisa! As for the other chocolate chip cookies, you can always use refined coconut oil, which is flavorless. Enjoy! Hi Simona, without any coconut sugar they won’t have any sweetness. You can replace equally with another dry sweetener. I wish more people would actually cook the recipe before they leave a review! That’s what I look for whenever I scroll through comments…. ya know… the people who actually make the recipe to see if I should invest in the ingredients! Hi Hope! Unfortunately, most people just leave their reviews on my Instagram page or via message instead of coming to comment – trust me, I wish everyone who made them commented too, haha! So glad you’re enjoying these, and thank you so much for sharing your feedback. Hi Rachel, can I use a regular egg instead of a flax egg? Just made these and they taste wonderful! They have been cooling for a while, but are still pretty soft in the middle–like may fall apart soft. I need to transport them to a party on foot this evening, so I hope they hold up in the cookie tin! Glad you’re enjoying them Michele! Are you sure they were cooked all the way through? If the middle was still shiny when pulling out the oven they probably weren’t, which would cause the crumbling issue! Hope they make it to the party alright and are enjoyed regardless! Just made these lovely cookies! I added a little cinnamon and vanilla extract to the mix and covered them in flat salt and they are a huge success! I imagine they won’t last very long, we’re gobbling them up as I’m writing this. Thanks for the great recipe!! just made this cookies, I added a little bit of vanilla extract and they were AMAZINGG! They were the perfect texture too! So happy you’re enjoying them! Thanks so much for your feedback, Camila. I make these cookies so often, they are amazing!! I’ve probably made them over 50 times. My boyfriend literally asks for them all the time and these are perfect because he is diabetic and coconut sugar is lower glycemic index! Thank you! That’s amazing!!! So happy to hear that you and your boyfriend are loving them. Thanks so much for sharing your feedback with me, Erica. OMG! These are amazing! I’m so impressed. Making a giant one as a cookie cake for my mom’s birthday, so i made one normal sized to try out beforehand. So simple, and totally gives you that cookie satisfaction, especially straight out of the oven. Thanks so much! Love the cookie cake idea!! Hope it’s a hit for your mom’s birthday :) thanks for sharing your feedback, Sarah! So thrilled you’re enjoying them! Thanks for the feedback, Dhara. Hi Usha, these can go from soft to crispy pretty quickly, so I’d watch the baking time and make sure your oven isn’t running hot, which can make them cook more quickly! Glad you’re enjoying them regardless. Hi Rachel, I’d love to make this but I need to use agave instead – – however, I don’t think this would enable the cookie to hold together. I wish coconut sugar didn’t spike my blood sugar so much! Any thoughts? Hi Janet, switching out a liquid for a granulated sweetener will make the texture very different and since I haven’t tested it that way, I’m not sure how it would go. You’d have to do some experimenting. Sorry I don’t have a better answer! I love the shape of these cookies! I should try making them sometime but with sunflower seed butter instead. That would be a great way to make them nut-free! Thanks Kam. Woah yum. Here, let me preheat my oven right now!! Thank you! Hope you love the cookies, Suzanne!